The 2019 NFL Draft is right around the corner. Last week, Liz Loza and Matt Harmon broke down the biggest names at quarterback and tight end, and this week it’s time to look into fantasy football’s glamour position: Running Backs. In this week’s fantasy football podcast however, Matt is joined by Eric Edholm, who returns to Yahoo as our NFL Draft Analyst! Before they get to the draft talk though, the New England Patriots and New York Giants made some noteworthy moves. In the wake of Rob Gronkowski’s retirement, the Pats signed tight end Austin Seferian-Jenkins (3:10), and of course he will deliver the same fantasy value as Gronk has always done (insert sarcasm here). The Giants, on the other hand, turned inward, signing wide receiver Sterling Shepard to an extension (7:10). Can he eat sans Odell Beckham, Jr., or will he be hindered by Eli Manning? 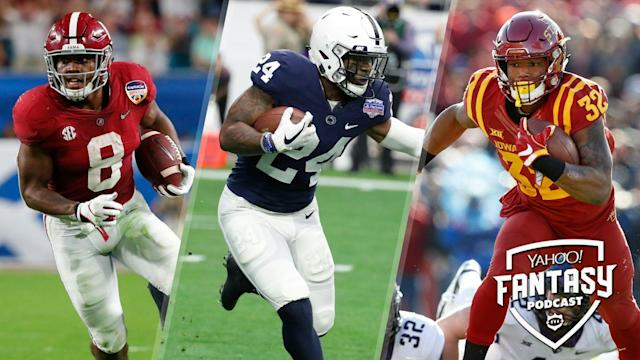 The incoming running back class is led by Alabama’s Josh Jacobs, but Matt and Eric also discuss what promise (if any) the likes of Miles Sanders, David Montgomery, Justice Hill, and Bryce Love will bring to both fantasy and reality (16:20).